Streaming music service Spotify can overwhelm you with choices: Its library of 18 million songs is really a lot of music, and its built-in options for music discovery are perhaps the weakest part of the serivce. But you don't have to end up stuck in a rut with your listening. Spotify apps—free plug-ins that work within the Spotify desktop software for OS X 10.5 or later, or Windows XP or later—can help you find music in the catalog you may have missed, whether that’s the latest releases or older songs from artists you didn’t know about. Here are six of the most helpful ones available. When you want to find new music, start with what you know. Filtr creates playlists based on an artist or genre you enter. It’s like personalized streaming radio, but you can see all the songs that are coming up and skip around as you please. I found Filtr created varied playlists and that most of the songs it chose were in line with the artist I started with. I entered Drive By Truckers, an alt-country band, and got a playlist with Jason Isobell and the 400 Unit, Son Volt, and Uncle Tupelo—all very much like my original artist. If Filtr creates a playlist you really like, you can save it and share it with friends. One option that would make it better would be the ability to create playlists based on a song, not just an artist or genre. Venerable music publication Rolling Stone is more than just a magazine these days. Its Rolling Stone Recommends Spotify app melds album and song reviews with easy access to the songs. You can listen while you read about new releases—it’s about as integrated as you can get. The app also includes curated playlists, including Rolling Stone picks for top songs of the summer or greatest guitar songs. I enjoy the playlists picked by musicians, such as Melissa Etheridge’s top Springsteen songs and Thurston Moore’s top punk songs. 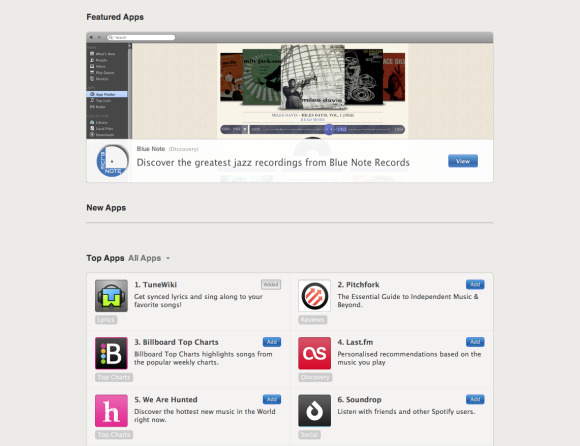 If Rolling Stone isn’t your style, NME, the Guardian, and other music review publications offer similar apps. Put your faith in the consensus to find the latest and greatest thing in music. Any Decent Music? aggregates music reviews from 50 sources to give each new release a composite score—it’s like Rotten Tomatoes for music. Beginning as a website, the ADM Spotify app uses this same information and makes it easy to listen to the top-rated new music. Click on a review and you can look at each individual review that created the composite score. On the Web, Hype Machine acts as a music blog aggregator and a great way to find new music. Its Spotify app serves a similar role, creating Spotify playlists from songs posted on influential music blogs. It’s like a reservoir of curated playlists—just find a music blogger you like and start listening. The playlists tend to focus on new tracks (as many music blogs do) and skew toward indie music more than any other genre. The app would benefit from the website’s Popular playlist—it would be great to be able to stream the most popular songs from the Hype Machine within Spotify. Jazz label Blue Note released some of jazz’s most lasting albums—think Miles Davis’s Kind of Blue and John Coltrane’s Blue Train. Most people who want to get into jazz can find their way to those artists. But how do you discover jazz beyond the big names? This app helps you find the right Blue Note jazz for your taste with filters by instrument, style, and time period. You can also have fun discovering the original source of rap and hip- hop samples in the Blue Break Beats section. Not a jazz fan? Labels such as Def Jam offer similar apps for other genres. If you aren’t a student of music history, delving into the deep catalog of classical and romantic music on Spotify can feel like homework. How does Haydn compare to Mozart? Is Mendelssohn a good match for my mood? Classify helps take some of the guesswork out of finding the right composer for your interests. In addition to listing bios of composers, the app offers playlists to match mood and instrument preferences, and lists similar composers.